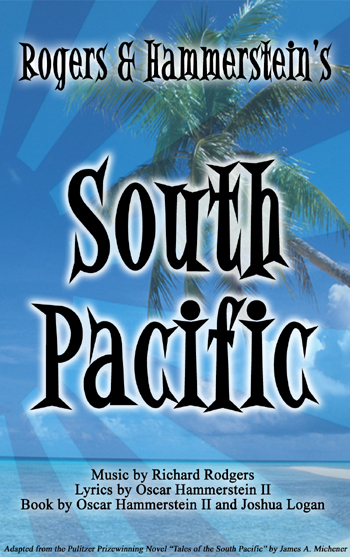 The Temple Theatre is rounding out the 2009-10 season with Rodgers & Hammerstein’s classic musical South Pacific – running from April 29 – May 16. I missed the opening weekend because I was out-of-town, so I decided to go Saturday night. I arrived just after the house doors opened and got an aisle seat in exchange for my last season ticket! As I sat there waiting for the show to start, I was getting a real kick out of watching the rest of the seats fill up! And fill up…….and fill up…….and fill up! By the time they closed the house doors and Kelly Wright came on stage to welcome everyone, there were no more than a handful of empty seats! THE HOUSE WAS FULL!!! YAY!!! (insert excited happy claps and big sh** eating grin here) And it was a great crowd — they really reacted to the show by showing how much they loved it! The immensely enjoyable show had all the right elements – recognizable classic songs (“There is Nothin’ Like a Dame”, “Bali Ha’i”, “I’m Gonna Wash That Man Right Out-A My Hair”, and “Some Enchanted Evening”, to name a few), fun characters (Bloody Mary was a real hoot), and amazing performances (more on that later). It gave the audience lots to laugh at and have fun with. Of course, Peggy Taphorn was incredible in the lead role of Ensign Nellie Forbush – a naive Navy nurse a long way from her Little Rock, Arkansas home on an island in the south Pacific. Nellie falls in love with a rich plantation owner – Emile De Becque, portrayed by Ken Griggs – amid racial tensions caused by her discovering he has two bi-racial children from a relationship he had with an island girl who died. Other racial complications are caused when Lt. Joe Cable (Danial S. Hines) falls in love with Bloody Mary’s daughter – Liat (Theya Havranek). Peggy’s performance was top-notch, but there were several others that stood out, as well. I mentioned Bloody Mary – Lakeisha Askew brings this character to life and makes her a joy to watch! From her deep belly laughs to her incredible singing voice, Lakeisha brought raw emotion to the stage and generated it in every audience member! She, alone, is reason enough to go see this show!!! I was also happy to see Ken Griggs return to the Temple Theatre as Emile de Becque – he has become a bit of a regular and brings a lot of dimension to his roles. I hope we continue to see more and more of him! Fun, love, songs, dance, and even a hilarious surprise performance by some of the sailors (I am NOT going to spoil this) — there is something for everyone! Keep the rest of the shows at sell out levels — go see South Pacific!